Successful treatment of gum disease (gingivitis) and mild periodontal disease can often be accomplished non-surgically with a periodontal “deep cleaning” that removes plaque and tartar (calculus) below the gumline. Our team at Periodontal Associates of Memphis includes multiple hygienists who perform these procedures every day. Scaling and root planing (SRP) is a periodontal cleaning technique that reaches up to 5mm below the gumline to scale away hidden plaque and tartar deposits. During the procedure, the root surface is planed to remove irregularities. Drs. Craddock and Godat routinely order root scaling and planing for patients to allow for more effective bacteria removal and healthier gums. When scaling and root planing is performed, bacteria below the gum line is removed and the surface of the root smoothed to allow the gum tissue to heal and reattach to the tooth. This reduces the depth of the gum pocket, preventing bacteria from gaining access, and reduces the chance that gum disease will spread to the bone. Teeth are less likely to become loose and fall out. Root planing removes bacteria that is living below the gum line, clearing the way for the gum tissue to heal from periodontal disease. Antibiotics or oral irrigators with anti-microbials (chemical agents or mouth rinses) may be recommended to help control the growth of bacteria that create toxins and cause periodontal disease. In some cases, our hygienists may place a locally delivered antibiotic in the periodontal pockets after scaling and root planing, to control infection and to encourage normal healing. To keep the disease from recurring, regular periodontal cleanings will be scheduled to take place every three to four months. 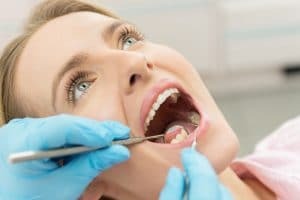 If the cleanings cause anxiety or discomfort, dental sedation may be used to keep the patient comfortable and relaxed. If a patient fails to follow-up with periodontal cleanings and gum disease worsens, laser therapy or surgical intervention may be required to address worsening periodontitis. It is advised to make and keep regular periodontal cleaning appointments to avoid advancement of periodontal disease. Contact us today for an appointment and discover what a deep cleaning can do.